Jehanzeb Khan, president of Khyber Trailers Drivers and Workers Union, announced the strike on 8th of January. The strike comes after the deaths and kidnapping of many truckers and crew members bringing supplies to Afghanistan, whose families have yet to be compensated for their loss. 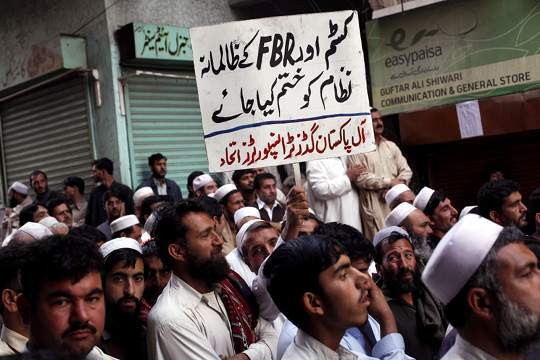 The All Pakistan Goods Transportation Association has also been unofficially blockading supplies to and from Afghanistan for the past week, in an action involving over 4000 trucks. In addition to increased security for workers, the strikers are demanding an end to a new customs law forcing all truckers to go through authorized private companies instead of making individual deals with the government's logistics cell. The truckers say these private companies are demanding extortionate fees, in addition to the bribes demanded by security officials throughout the Khyber area. The strike will affect supplies reaching NATO troops in Afghanistan, forcing NATO to use longer supply routes through Russia and Central Asia. Past blockades have cost over $100 million extra due to the longer routes. More information here and here.